Won't flake, crack, or chip and dries to a beautiful matte finish. 16-oz. plastic bottles. Non-toxic. 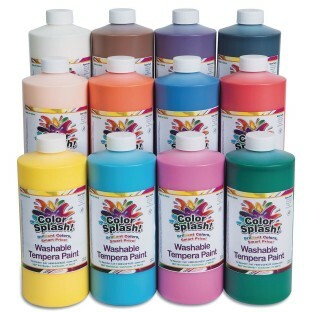 Includes red, blue, green, yellow, orange, peach, violet, turquoise, black, white, magenta, and brown. Shake well before use. 16-oz Paint Pumps sold separately (Item #AS639. For tips on Washable Tempera clean up for stained skin and clothing, please click the View Instructions link on the Product Details Tab. Perfect for all our indoor crafts ! The paint also washes out of clothes easily ! I was not happy with this product at first. I think it froze during shipping. The product was not mixed and carried no pigment. I'll try again because I am usually quite pleased with color splash products. We used this product for stamping placemats for a thanksgiving event. It was okay but not enough pigment. Merchant response: Our customer's feedback on their experiences with our products and service is vital as it helps us to identify problems. Reviews are sent to the appropriate departments and suitable actions will be taken. Thank you for your recent product review. Great color variety. Washes easily. Great value!